Cut 3 avocados in half lengthwise, remove pits, scrape the flesh of the avocado out with a spoon. 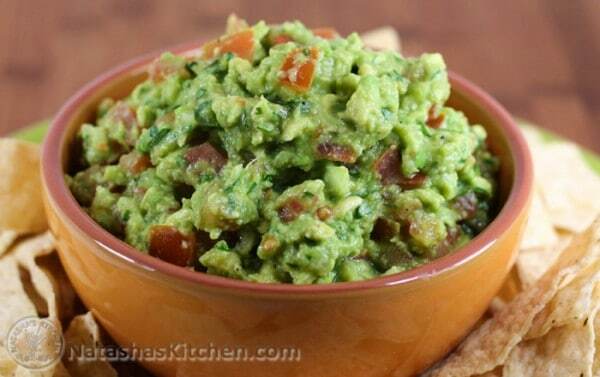 Place in a medium bowl with a flat bottom and mash avocados with a potato masher. Add the rest of the ingredients to the bowl (tomatoes, onion, cilantro, lemon juice) Mix well and add salt and pepper plus more lemon juice if desired. -Select avocados that are slightly soft to the touch; Don't buy avocados that are rock hard or ones that feel like applesauce would ooze out. -If you are not going to make them right away, you can keep the firmer ones on the counters to ripen. -If they are just right and you aren't going to make them for a couple of days, put them in a paper bag and place in the fridge. To keep your guacamole from browning too quickly, insert the pit from the avocado in to the finish product before refrigerating.